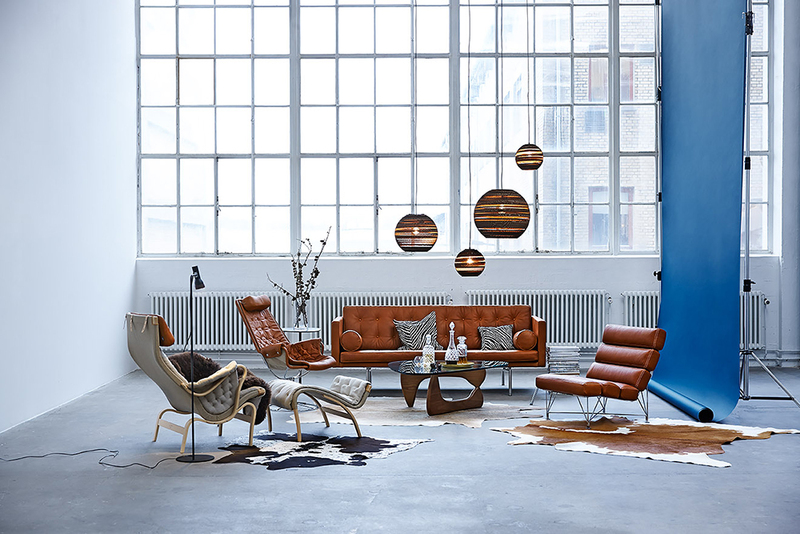 If you follow me on Social Media, you’ll have seen that I recently visited Clerkenwell Design week in London. It’s a must see event featuring the very latest in design as well as touching base with some old favourites such as Scraplights by Graypants. 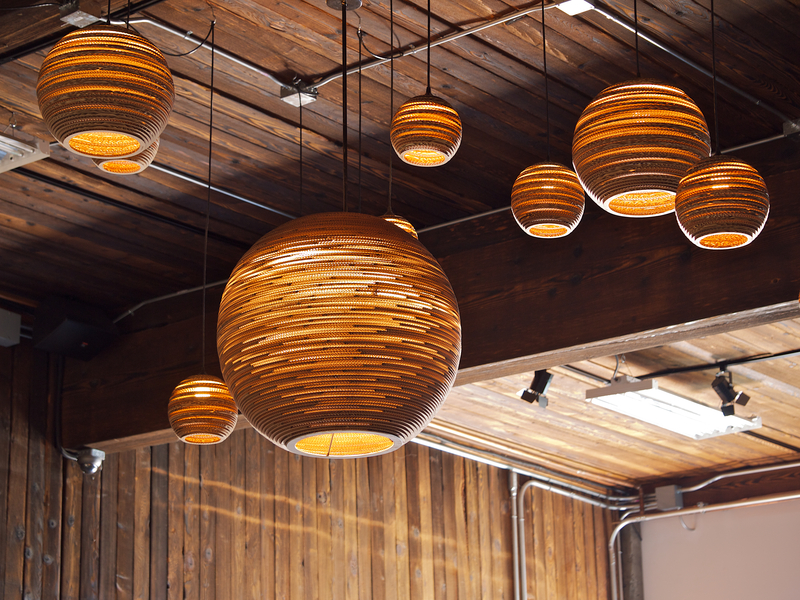 I have to say these decorative pendant lights hold me captivated every time I see them. It’s not just their swoon worthy, good-looking textured forms, or how they provide warm, intimate ambient lighting that gets my attention. Nope, it’s because these beauties are in fact handcrafted from recycled cardboard. Yes, cardboard! In case you haven’t come across of Graypants before, they’re a design studio whose sustainability ethos through the use of their materials and production have made them hugely successful. Graypants Scraplights series are their most accomplished and popular designs to date. I’m constantly drawn to decorative lighting. It is, without a doubt, one of the easiest ways to update a space. It can add impact, create interest and provide mood enhancing attributes to any room. With Scraplights, they have the added bonus of being environmentally friendly too. For me, this makes them an all-round winner! 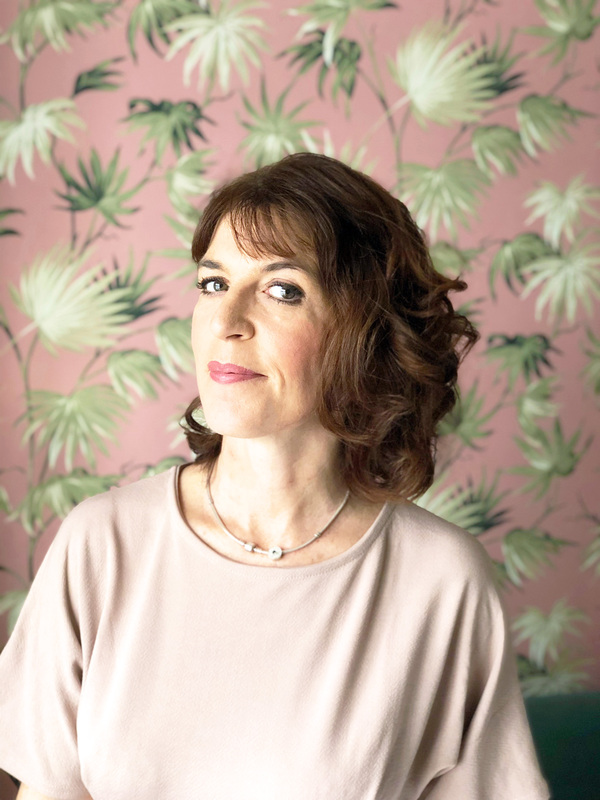 Heres the low down on Graypants and their brilliant Scraplights…….. 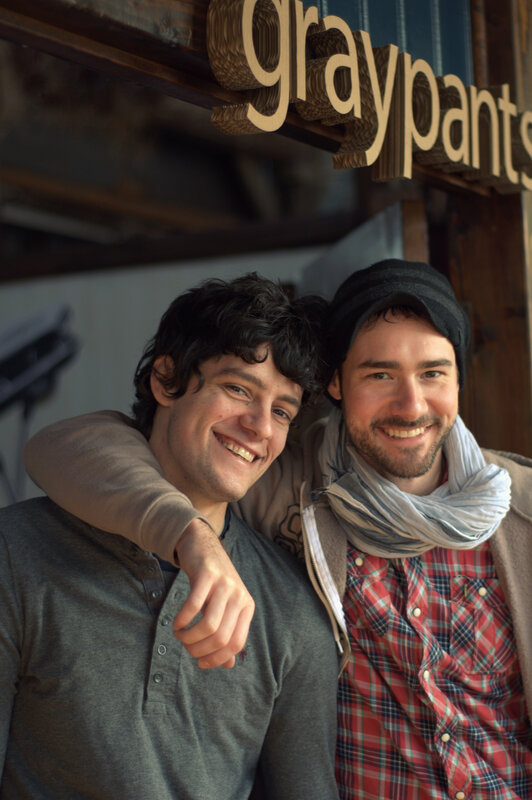 The founders of Graypants Jon Junker and Seth Grizzle are based in Seattle. 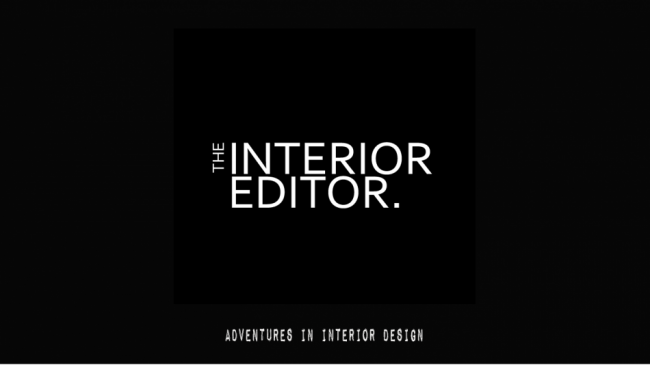 They are in fact architects who decided to fuel their creative juices through product and art design. Graypants was formed after the pair met wearing the same grey pants in 2007. 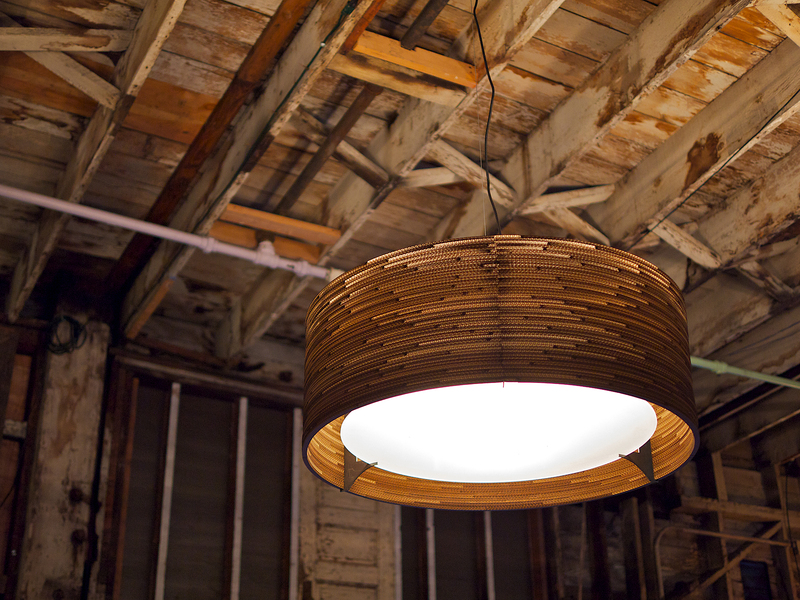 An idea of repurposing corrugated cardboard into pendant lights was born. 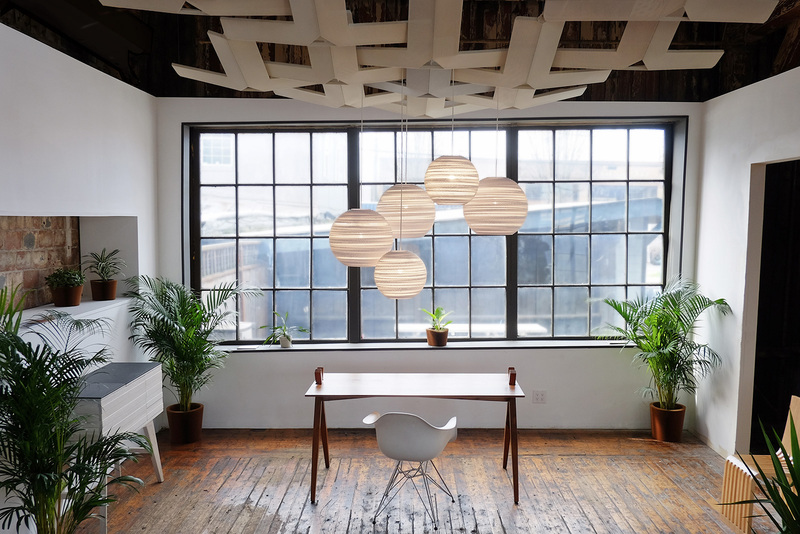 Since then this design duo have designed a multitude of chairs, tables and even dog houses out of recyclable materials, but Scraplights that have been their greatest creation to date. It’s a rather clever how each Scraplight design is created. 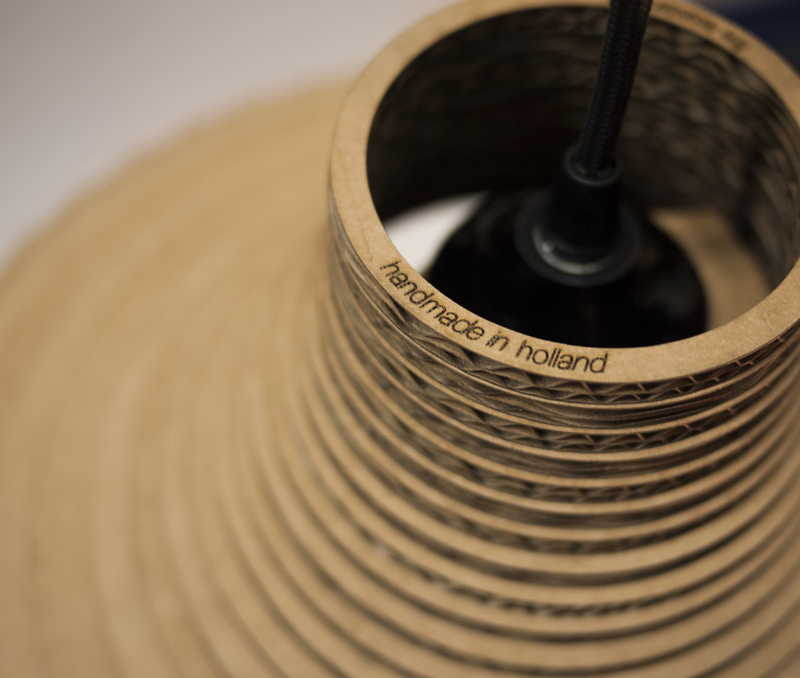 Rings of recycled cardboard are precision cut with a laser, and then glued together using non-toxic adhesives. They can be hung simply with cord sets and can be hard-wired or plugged in. I like how they’re robust and elegant looking at the same time. And for those of you that are concerned, all Scraplights are treated with an environmentally friendly fire-retardant. 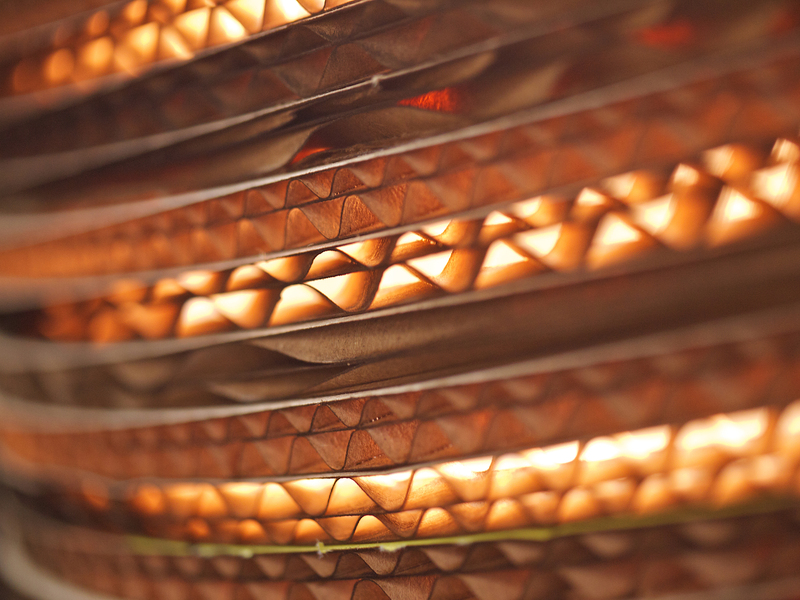 Don’t you just love how warm light seeps through the shades textured wavy surface? Wonderful shadows are produced creating a warm friendly vibes. 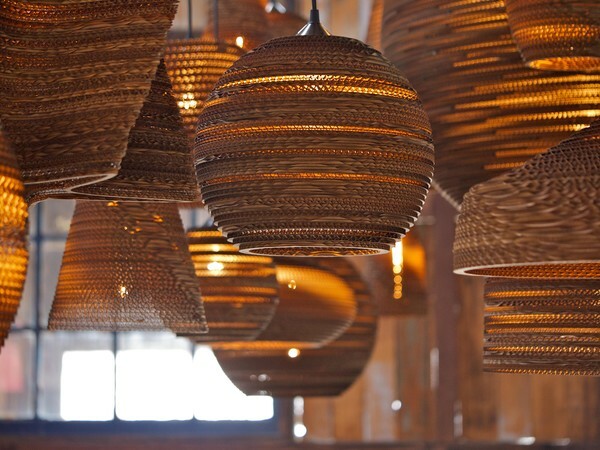 It’s surprising how tactile and desirable recycled cardboard can be in the form of lighting. The Amsterdam studio was founded in 2012, and has since become a hub for local European production and distribution to over 40 countries. It’s also partnered with local work programs to provide craft based work where it is most needed. 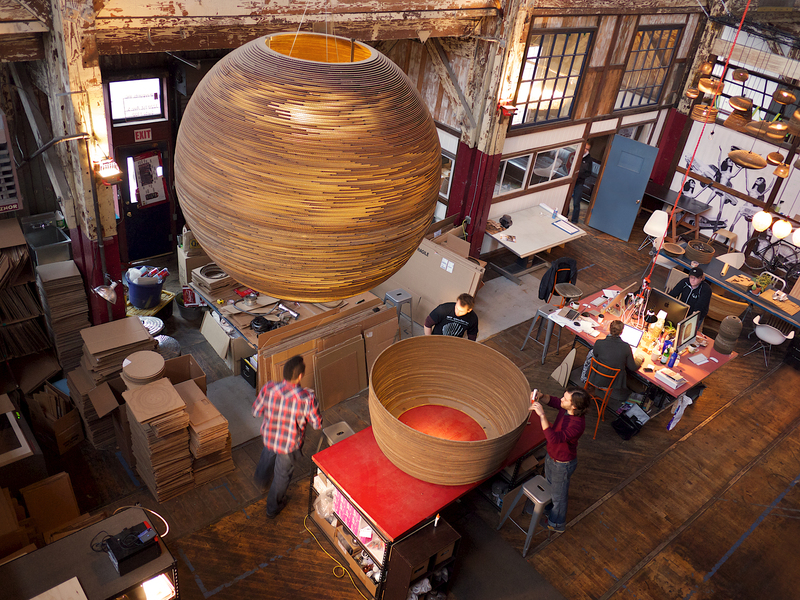 The Seattle studio provides local production for North America and houses the bustling custom and prototyping shop. 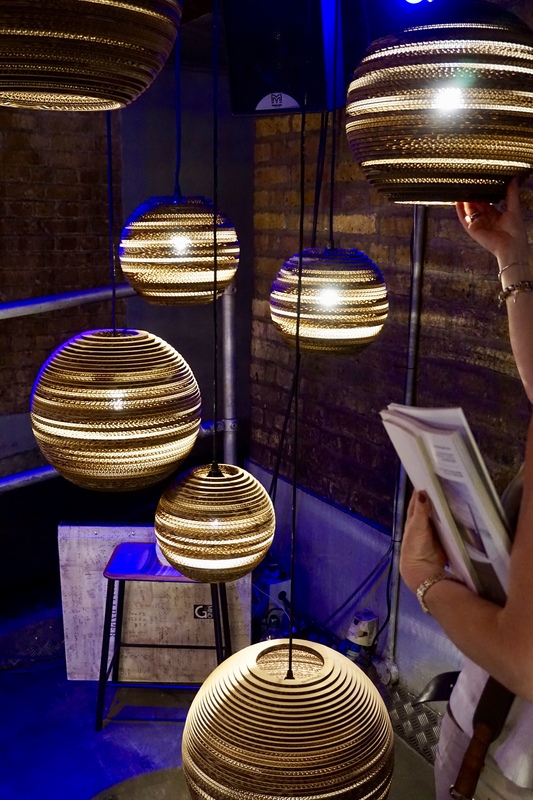 Expanding their range of lighting and furnishings, Graypants have developed a worldwide distribution network for both retail and business markets, which has allowed them to become more involved in developing local, responsible and sustainable production methods. Check out this fab video on Scraplights in the making. With 20 designs in Graypants Scraplights series, there’s plenty to choose from. Their forms ranging from the celestial Moon, to sophisticated drums, cones, drops bells and Quads. Whether you choose from one Scraplight or a combination of the same/different forms, Scraplights are sure to enhance any space they adorn. 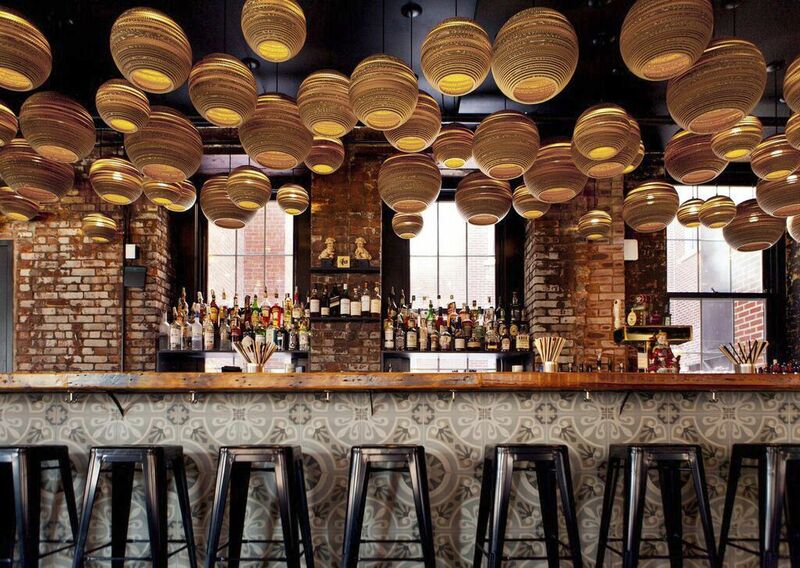 It’s no surprise that Scraplights have become a popular choice for restaurants and bars. The warm and welcoming glow they create provides the perfect intimate ambience for such spaces. There is, of course no reason why you can’t replicate this in your homes. We all have spaces in our homes that cry out for some decorative mood enhancing lighting. I’m thinking dining or bedroom space or perhaps a cosy snug area. Moons are part of the Scraplight series perfect for those of you whose colour palette veers towards a more neutral spectrum. 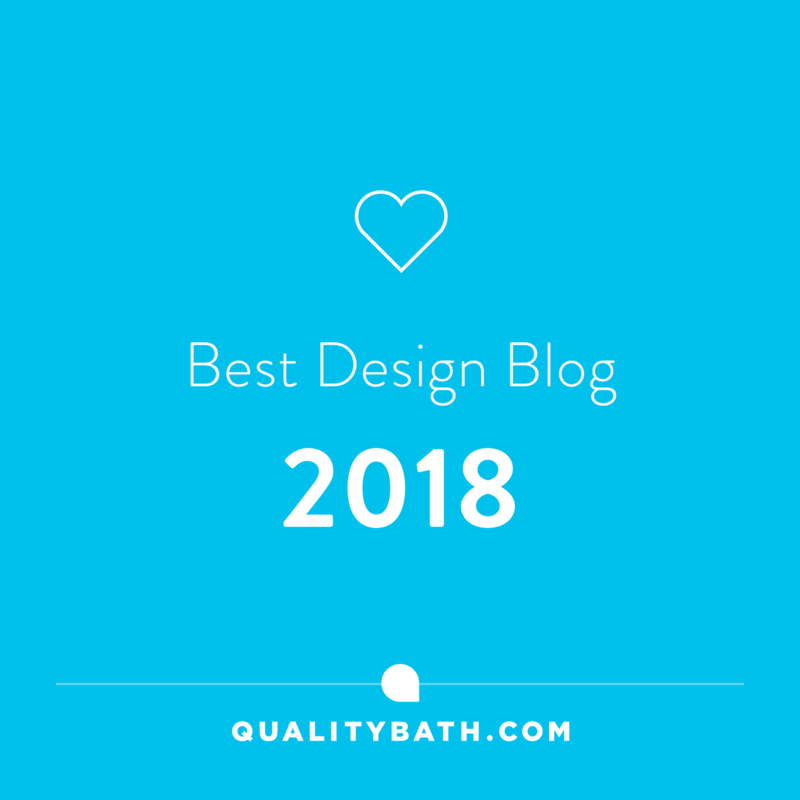 I’m positive these award-winning designers will continue to captivate us with their wonderful sustainable designs and environmental approach to their work. I know they have my admiration, but what about yours? Until next time, thanks for stopping by…..